I opened the laptop last week to retrieve the HDD. This is what I found. Definitely the battery; it is swollen and burned. The fire did not reach the HDD. I was able to pull it, retrieve data and then encrypt. 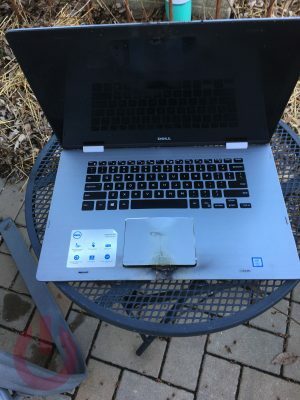 Dell wants the burned machine back as part of the support case. After a bit of back and forth with Dell about the replacement machine they sent me a refurbished Inspiron 15 7573. It is a slightly newer, slightly nicer version of what I had; i7 eight gen v. seventh, 16gb mem v. 12gb, etc. The new to me laptop arrived on Friday. So far, knock on wood, it is fine. It gets turned off when not used rather than relying on sleep mode. As a refurbished machine it comes with a 90 day warranty. The Dell tech assured me that if the replacement machine has the same issue that Dell will stand behind its product. I am happy that Dell replaced my laptop. I am not happy that this is why I had to interface with their technical support team. If there is any further excitement I will post.